When we think of gifted underachievement, the example that springs to mind most readily is a student who is clearly capable of producing work of a remarkable quality, but who is simply refusing to engage at school. They are ostensibly doing the work but not actually putting in any significant effort. However, perhaps less obvious, yet all too common, is the successful, well-adjusted student that causes no worry or concern for their parents or teachers because their high grades and strong social skills make everything appear to be going swimmingly. This second type of underachievement is just as concerning — these students are just disengaged in a different way, having abandoned all hope that anyone will ever offer anything meaningful to work on, they respond to their understimulating school environment by pursuing intellectual passions outside of school, all the while performing well on classwork, homework, and tests. These underachievers have “given up” on school, in a way: they have decided that it will always be easy and not ever really allow them to really pursue their interests fully. Regardless, they are still motivated enough to perform at a high level; getting good grades and being well-liked by peers and adults at school is evidently enough positive feedback to motivate them to continue those behaviors. They could be leading a double life. Such students —the talented but intellectually malnourished — may be carrying an invisible burden that also gets in the way of genuine engagement at school. If they get straight As but are capable of more, by suppressing their authentic, voraciously curious selves, they have made a choice to masquerade as a different kind of person than they really are. This playacting can be psychologically damaging, especially if successful, in that they are being positively reinforced for not being genuine… which implies that who they actually are is wrong, broken, or unacceptable. As you can imagine, behaving as though they value conformity and people-pleasing over self-actualization can cause significant emotional stress. Underachievement may remain generally unnoticed when a student is delivering better-than-average accomplishments. But the experience of school is mostly a waiting game for them: waiting to finally encounter challenging material; waiting to get to the work that engages their brain in class; compliantly waiting to those high school courses or college programs that offer the freedom to finally be able to pursue the advanced topics that fascinate their minds. Misunderstood and bored, these children will likely continue to perform this way year after year until high school and on to college, having never been academically challenged and having never needed to learn the study skills that their peers mastered long ago; as a result, just when they finally have access to the material they’ve been ready for for quite some time, they may experience a very difficult transition to college. Worse, these students may mistake the “extra effort” to which they must suddenly go to learn their coursework as failure or a lack of ability. Letting these students slide under the radar for years has not only wasted their time, but has set them up for a very frustrating and difficult freshman year. Meaningfulness — The task must be tied to the student’s identity; personally interesting; integral to the student’s vision of the future; and viewed as useful by the student. Gifted students are (understandably) particularly disinterested in doing things that feel like “checking the box,” and highly likely to resent being given busywork to which they feel no connection or in which they see no inherent value. Environmental perception — Students must trust that success is actually possible in the situation; in other words, a student thinking things like, “my teacher doesn’t like me,” “I can’t think in this room because it’s so loud in here,” or “this is baby stuff, not real learning” is letting his or her perception of the environment influence their ability to perform at their best. Self-efficacy — Students must believe that they have the ability to do well; a combination of prior experience, vicarious experience, social persuasion, and emotional and psychological states comprise the student’s perception that success is, indeed, possible. Understandably, without this belief, they are not going to perform the task well, since lack of faith in one’s abilities to succeed is often a self-fulfilling prophecy. 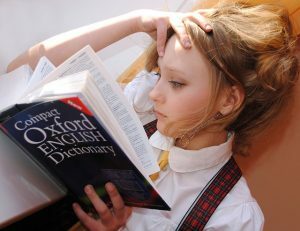 Self-regulation — Combining management strategies (such as study habits), personal standards (comfort with taking intellectual risks), and self-motivation (focus and ability to tolerate delayed gratification), this factor is crucial and determinative in achievement across all students, not just gifted ones. In fact, high achievers in the top 2 quintiles of a high school population are more likely to be students with high self-regulation than students with high IQ. Essentially, in this model, while high achievers have different quantities of each of these components, they do have all of them. If someone is an underachiever, then, one of these areas is insufficient for their performance to reflect their true capability. This kind of situation is often the most vexing for faculty: a student with clear ability who is choosing to not participate, not learn, and not engage. What is a frustrated teacher to do, then? One of the most important things we can do at a school for gifted children is to pay attention to our students’ individual interests and their vision of the future for themselves. Students who want to become astronauts, for example, are less likely to be lured into engagement with poetry assignments than they are by science assignments. However, if an English teacher can be flexible in their curriculum to connect these two fields (by finding poetry written about space and/or by astronauts? ), the student is more likely to actively engage in the lesson because they see a connection to something they actually care about. The more explicit the connection, the better — the goal is to show them how the things they learn in the classroom are connected to things that are already important to them. In high school, when the stakes are higher because of the impact grades have on college admissions opportunities, the downside of disengagement is the potential for long-term negative consequences for students, leading parents or teachers to feel like it’s “too late” to change the student’s attitude towards school, especially if it has been a long time since the student took any real joy in learning. Similarly, the straight-A student who has never really been taught how to tackle new, complex topics may be set up for failure in the long term, having never had the chance to develop resilience. There is a cure for underachievement. These factors are why many parents turn to homeschooling, to enrichment programs, or to schools like ours that are often so different from other options. These types of education or acceleration include a tremendous emphasis on independent work, which of course has student interest in the chosen topic as its primary ingredient, and comes along with control over what they are learning. Having had their intrinsic motivation stoked in this way, students really do “lean in” and tackle problems which are much more challenging and complex than their teachers may have thought they were capable of (and potentially more than they thought themselves to be capable of, too). Additionally, this kind of learning opportunity conveys to students that their teachers care about what matters to them and will help them reach goals they set for themselves. Here’s hoping that there’s something to be learned from both flavors of underachievement: whether it’s a high-performing student or one who’s “phoning it in,” the best medicine is provoking authentic engagement in learning by enlisting the help of the student’s own passions — and showing them that you believe in their abilities and will let them dive deeply into a subject that they love. Doesn’t that sound like a school you’d want to go to, too? Siegle, D., Reis, S. M., & McCoach, D. B. (2006). A study to increase academic achievement among gifted underachievers. Poster presented at the 2006 Institute of Education Sciences Research Conference.Washington, DC. Duckworth, A. L.; Steen, T. A.; Seligman, M. E. P.; National Library of Medicine (2005). Positive psychology in clinical practice. Annual review of clinical psychology Vol. 1: 629-651. 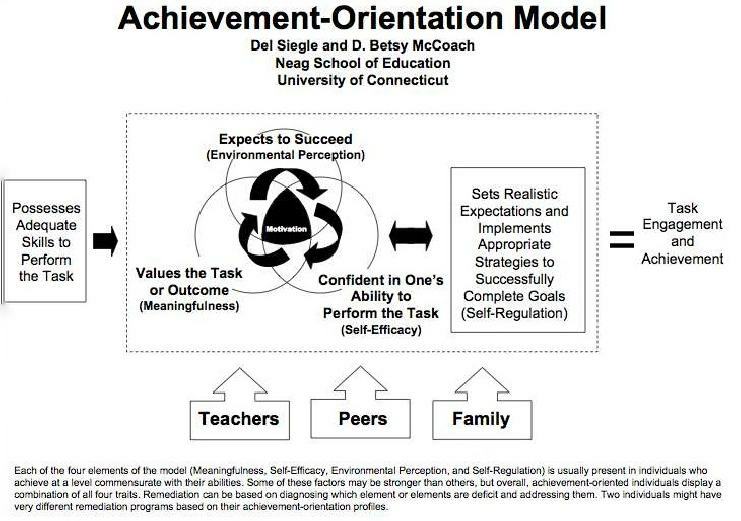 This particular slide of the Achievement-Orientation model is from “Addressing underachievement and motivation in gifted students” presented by Del Seigle, the University of Connecticut’s Neag School of Education, Summer 2015. This post is part of the Hoagies’ Gifted Blog Hop where you can read more on this important topic. Great post. I completely agree that too many gifted kids remain hidden because they continue to perform at above average to high levels. 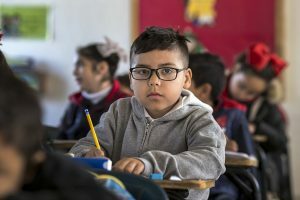 I have written before about “underachievers under-the-radar.” Schools tend to ignore them because they seem to do well – but the damage that is done is significant, since they become apathetic, hopeless, and rarely live up to their potential. Thanks, Gail – I will pass on to Jill. I hope you can join us on October 27. Would love to continue our conversation from last year.